This photo shows the Arlington Hotel, which occupied the block on the west side of Carson, between Spear and Robinson. The hotel was built in 1877, and torn down in the 1960s. This detail shows the northeast corner of the hotel. 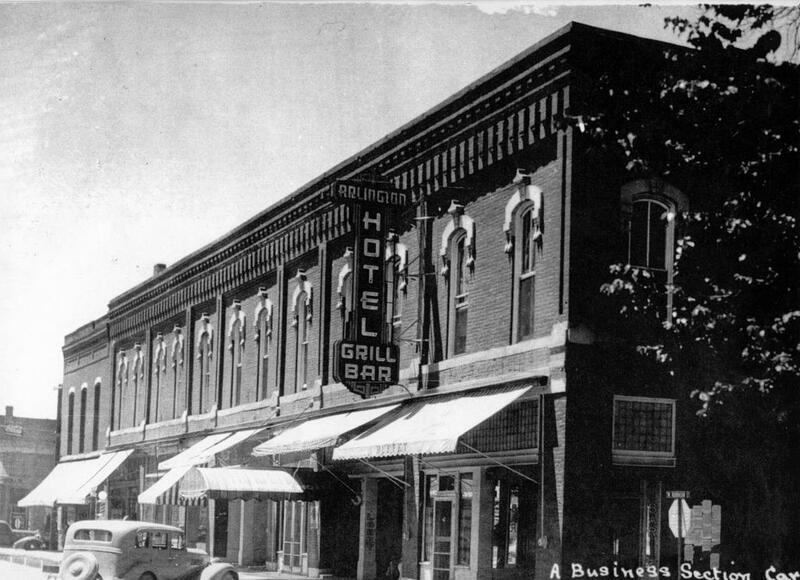 A large neon sign hanging off the side of the building reads "Arlington Hotel - Grill, Bar". The grill and bar sit at the very corner of the building. Lettering on the awning reads "Buffet", and "Bar" is painted on the windows. The next door to the left says "Lobby". Further down the street are various other businesses, including a barber shop whose pole is visible. At the far left, you can see the facade is different. That short segment was actually part of another building, the Gray Reid Wright Building. It was adjacent to the Arlington, and demolished at the same time.